The best bikes in GTA 5 Online hit in terms of speed and lap times even the super sports car provide the fastest means of transportation in Los Santos. 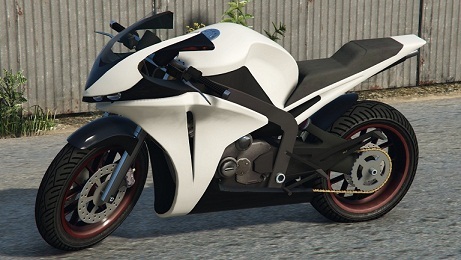 But which motorbike is it really the fastest and best for GTA Online? Our ultimate ranking answered this question. The following ranking is designed either for purely technical routes or even for pure high-speed courses, but present the best bikes for routes on which both aspects are important. You can use them for the most races in GTA Online and does nothing wrong. As a test basis for ranking the track all motorcycles were tested on "Cutting Coroners GP". It is a street circuit, both with many curves, as well as with high-speed sections. Here, each model has been provided with all performance-enhancing upgrades to achieve the best result. - Third-placed Shitzu Hakuchou makes itself especially well on long straights. Disadvantages exist only in the corners where it lacks traction and the high weight makes it complacent in the curves. - In terms of acceleration, the Dinka Akuma makes so quickly. It is also easier to control than the Pegassi Bati 801, making it the right choice for almost every race. - With Pegassi Bati 801 you can achieve the fastest lap times. However, it is more difficult to control than the Dinka Akuma. However, if you bring the necessary sensitivity, it benefits from the higher top speed, better traction and more effective braking. You can also watch the best bikes in the following YouTube video.